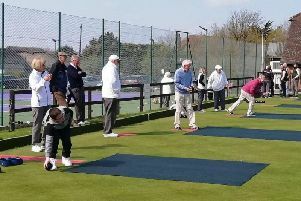 Sixty Bognor seniors played in the very popular Brian Poston Greensomes. Brian was club secretary for many years up to his retirement in the late 1990s and is still a regular player at the club. Winners with an excellent score of nett 63 were Ron Stevens and Willie Dunn. Second were John Chapman and Keith Simpson with 64, and third with 64.5 were Richard Kaemena and Malcolm Dodds. Fourth with a nett 65 were Cliff Willis and Roger Selway. Nearest the pins were awarded to Barry Vanstone, Willie Dunn, Barry Appleby and Keith Tempest. Brian’s favourite prize of drive nearest the rope on hole 17 was won by David Chalmers. Brian presented the prizes. Bognor seniors have had a run of six games in 16 days and finished with a creditable three wins and three losses. At home to Petersfield, Bognor ran out 4-2 winners. This score is aggregated with the result earlier in the season at Petersfield to find out the 2018 winner of the PeteBog Trophy. Bognor just lost out 6½-5½ and Petersfield are the 2018 winners. The day was a fantastic success and we are thrilled to be able to raise £4,000 for St Wilfrid’s Hospice who provide high quality palliative and end of life care in the community. Results: Terry Kuhler & Barry Ingate lost 5&3, Dave Turner & Ian Paine halved, Mick Matthews & Ray Leggett won 2&1, John Woodhead & Hugh Diaper halved, Richard Kaeme & Ken Catt won 3&2, Alan Fitzgerald & Paul Black won 2&1. Bognor the made the short journey to Worthing and for the second time in a row came away with an excellent win, this one 4½-3½. Results: David Turner & Chris Hickling halved, Terry Kuhlet & Trevor Till won 2&1, David Chalmers & Brian Wolstencroft lost 4&3, Steve King & Richard Beresford won 4&2, Richard Hedge & Keith Cook won 3&2, Richard Perry & Clive Millett won 4&2, JJ Stephenson & Sean Francis lost 2 down, Richard Kaemena & Ian Paine lost 4&3. Bognor hosted Rowlands Castle and ran out comfortable winners 6½-1½, but two days later Bognor lost 6-2 at Cowdray Park. Two further games against The Dyke at home and Southwick Park away were lost 5-3 and 6-0. Southwick Park seniors captain Peter Wright scored an excellent nett 61 in his 4&3 win over Bognor captain Mike Oates. Even though Bognor suffered this heavy defeat, four out of the six games went to the 18th hole. Scores v The Dyke: David Turner & Terry Kuhlet won 2up, John Owen & Trevor Till lost 4&3, Ian Paine & JJ Stephenson lost 4&3, Hugh Diaper & Chris Hickling halved, Richard Hedge & Barry Ingate lost 3&2, David Standing & Alan Delves lost 2&1, Paul Black & Ray Leggett won 6&4. Professional and amateur golfers as well as friends and family enjoyed Cowdray Golf’s charity pro-am held. The action-packed, fun-filled day which took place in glorious sunshine succeeded in raising £4,000 in aid of St Wilfrid’s Hospice in Chichester. Forty-six teams of four, comprising one professional and three amateurs, played 18 holes of Cowdray’s immaculately prepared championship golf course. Administered by the South Region PGA, the tournament was once again the largest pro-am in Sussex. Prizes were presented by Lord and Lady Cowdray’s son Peregrine, who also played in the event, as did his brother Monty, who entered a team. The winning team was Clarke Gammon, with an impressive 15 under par score. They won custom-fit irons made by Ping and an overnight stay at Ping’s headquarters in Gainsborough, Lincolnshire. The winning professional-player prize was shared by Ian Golding and Guy Woodman, who shot the same score of 67. They won significant prize money. Special mention should go to Cowdray’s lady professional player Hannah Ralph who got a hole in one on the third, and to Lawrence Potts, who was nearest the pin on the 18th, winning three nights at the Algarve-based Aqualuz hotel and two rounds of golf on the Espiche Golf Course. No-one hit a hole in one on the ninth hole to claim an Audi A1 courtesy of Harwoods. Tim Allen, Cowdray’s director of golf, said: “The day was a fantastic success and we are thrilled to be able to raise £4,000 for St Wilfrid’s Hospice who provide high quality palliative and end of life care in the community. “St Wilfrid’s Hospice is club captain Ken Chapman’s chosen charity for the year. “Many thanks to our sponsors including Greene King brewery and Harwoods Group. “Course manager Jonathan Smith and his team ensured the course was in an immaculate condition, the hospitality team worked hard throughout the day under head chef Jon Lander and thanks also to Ken Chapman and Rob Marjoram for their valuable input. The prizegiving ceremony took place later that evening. Huge congratulations to Dave Hirons and Dan Hill, who won the Purcell Cup with 45 points. Second place went to Mark Howes and Ian Knight with 43 and third were Sean Gallagher and Scott Evans, also on 43. Winner of the June Stableford was Roger Hyde with 37 points. Second was Mick Shotter with 34 and third Andrew Pay with 33. In a ladies’ Ping four-ball better-ball competition, Myrna Heustice and Pauline Alexander won with 43 points. Runners-up were Jill Parry and Sally Williams with 42, and third were Amanda Lucking and Polly Sullivan.